'Tis the season for a wide variety of "best of" posts, so in the spirit of the season we've put together a list of our 10 favorite cat books of the year. This list easily could have been twice it's length and paring it down to 10 was very difficult. For clarification, we only chose books that were released in 2016. When you click on each book's link you will be taken to our Tortie Shorties review, and in some cases an interview with a fantastic feline! 10. Shop Cats of New York by Tamar Arslanian. Full review to come in the new year! 9. Christmas at the Cat Cafe by by Melissa Daley. A heartwarming Christmas story focusing on family, forgiveness, friendship, food...and some pretty unforgettable cats. The only thing better than visiting a cat cafe is having the opportunity to visit one at Christmas, and this book allows readers to do just that. 8. To Catch a Cat: How Three Stray Kittens Rescued Me by Heather Green. The story of a New Jersey couple who brings a little feral family into their hearts and home and end up learning more about themselves and their relationship in the process. This book make me so grateful that there are people out there making a difference and being a voice for the most innocent among us. 7. Catlantis by Anna Starobinets. When asked to review this book I had my doubts that I'd enjoy it because I'm not a fan of fantasy, but I found it to be absolutely enchanting and a must-read for cat lovers of all ages. The story of Baguette the lovesick tabby and his treasured Purriana and everything he goes through for the honor of winning her paw in marriage is a pure delight, as are the adorable drawings that accompany the text. 6. Surviving Cancer, Healing People: One Cat's Story by Sula, Parish Cat at Old Mission. 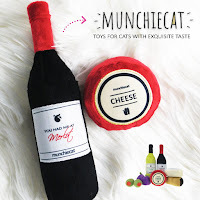 Sula's "meowmoir" is part story of a very special cat, part history lesson, part travelogue. She's proof that if there is such a thing as angels on earth, they come in the form of fur and four legs. 5. Cat Shout for Joy by Shirley Rousseau Murphy. 2016 marked the 20th anniversary of the publishing of the very first Joe Grey mystery. Like so many other long-running series I've fallen woefully behind in reading, I still found myself completely engrossed in Joe, Dulcie, and their sidekick Kit "the flightly tortoiseshell". From new beginnings to a heart-breaking goodbye, this mystery has it all. 4. The True Tails of Baker and Taylor: The Library Cats Who Left Their Pawprints on a Small Town . . . and the World by Jan Louch and Lisa Rogak. I'm almost embarrassed to admit that until this book I had never heard of the Baker and Taylor cats. 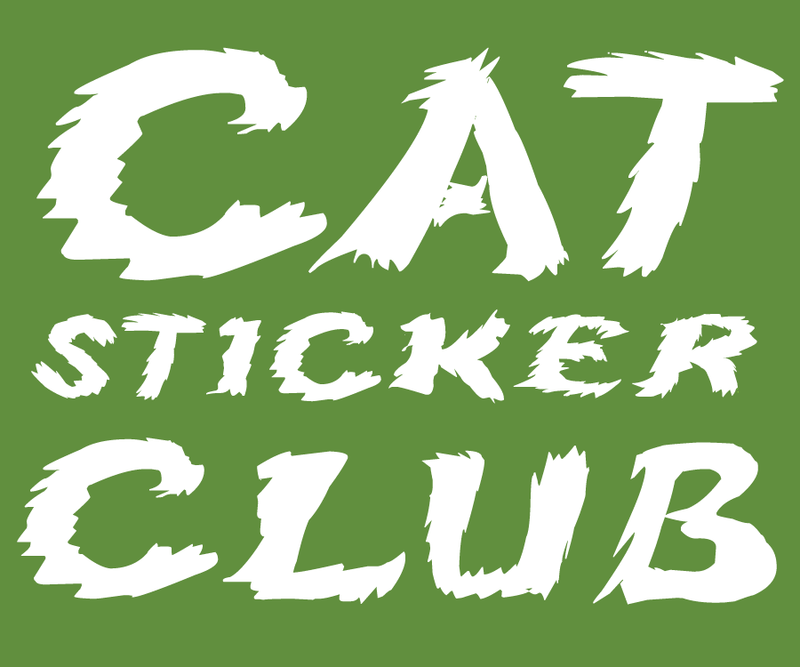 My only excuse is that their heyday was in the 1980's, my childhood years when I was a frequent patron of my local library but not as enmeshed in cat culture as I am today. This beautiful memoir is a love letter to cats and books and I felt such a kinship with the author as she detailed the connection that so many of us feel to both. 2. Kit Kat and Lucy: The Country Cats Who Changed a City Girl's World by Lonnie Hull DuPont. 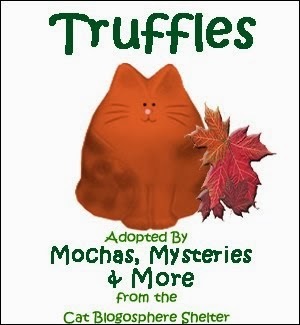 A tortie on the cover drew me in as well as the fact that Kit Kat was a name I had considered for Mudpie. The story inside about how a woman's life was changed by two very special cats following a drastic move to the country landed it in runner-up status on my 2016 list. 1. The Ghost of Christmas Paws by Mandy Morton. Over the past year I've fallen in love with Hettie Bagshot and her sidekick Tilly as they live their cozy little lives in a back room apartment of a bakery. Their Christmas adventure taking place in a manor house on the Cornish coast will be a holiday re-read in my home for many years to come. One of my favorite cat cozies *ever*!!! 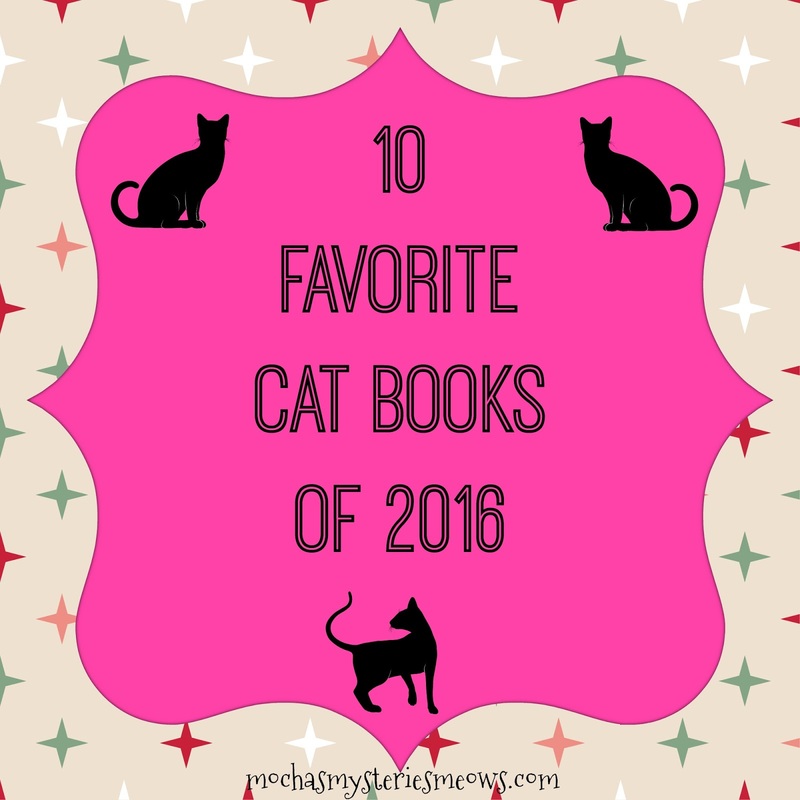 What was YOUR favorite cat book of 2016? Happy Mew Year! My favorite Book right now is about Iris Grace, the talented autistic girl and her therapy cat, Thula. Beautiful photos and the story touches the heart with inspurration. I love the Joe Grey I have several cat series that I love. I do not have time to keep up with them all, either! We have several of these books, and love them too! Cool list. 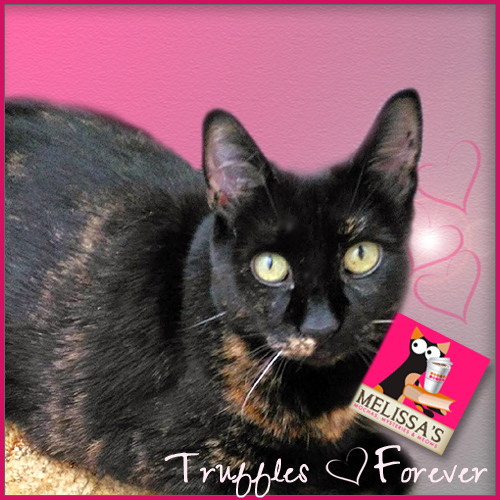 Ours list and Golden Purrs Awards includes two from your list. There are a few I never got around to reading and I can never have one favorite :-) Happy Mew Year's Day. Thanks, Melissa, wish I could have them all. That is a great selection of books. We need to get mum into reading some of them. This is a great list! I really wanted #9 this season but couldn't find it. I'm going to order it and hope I have restraint to wait until next Christmas season to read it. I love the Joe Grey series. I remember when Kit first appeared. I think that's one of my favorites out of that series. 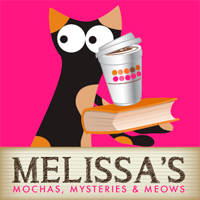 I have a few cozy series I read that feature cats that I love: Cats in Trouble, Black Cat Bookshop (I'm so bummed that there will be no more in that series), Magical Cats, Bookmobile Cat Mystery. Thanks for this list! We always love seeing what books you recommend, and then they get added to our to-read list! We are finishing out the Christmas season by reading one of the books you recently reviewed - The Silence of the Elves! Oh, how we love some of these books and love reading them aloud to kitties on cold winter nights, or during loud 4th of Julys. We need to check out the others! Yeah, I was gonna ax about Makin’ Biscuits but see that Ellen mentioned it. I hate making those lists. So many cat books. What a good idea to review them. Looks like a great list and one I will definitely be referring to. I have the Baker & Taylor book sitting on my shelf waiting to read! 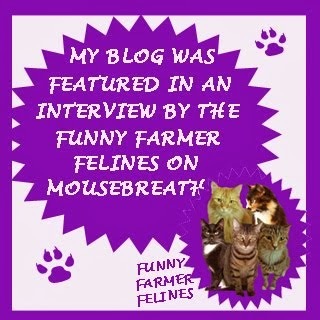 FRAPPYCAT.....A BOOK ABOUT RESCUING CATS AND A LOOK AT A HANDICAPPED CAT THAT WAS FOSTERED AND ADOPTED. Just saw this, nearly a year later! Thanks for including Sula's first book. With first books, bring noticed counts so very much -- thanks for helping get the word out. I hope you will someday be able to visit Sula in San Juan Bautista.